Whether you have a full-time job and want to make a little money on the side or you would like to earn an income while being a stay-at-home mom or homeschooling your kids, opportunities abound. Getting a minimum wage job is not always cost-effective, nor is it easy to find one with an accommodating schedule. Instead of traditional jobs, numerous teachers and parents are becoming micropreneurs, creating income opportunities that fit their own unique interests, skills and scheduling needs. Tutoring is an easy way for teachers to make money on the side. You can choose to work for a tutoring company and have them help find clients or simply advertise around your neighborhood. During the school year, parents may hire tutors to help their children improve in a specific subject area. Many also seek out tutors in the summer to help their children get ahead or keep them from losing information during their time away from school. And while tutoring may be best suited for teachers, it is not limited to certified educators. If you have a bachelor’s degree in an area where students need help, you may be qualified to tutor students who need help. Companies such as WyzAnt and Club Z can help you find local students to tutor in your area. If you have children at home or cannot find students to tutor in your local area, you can also tutor online. Sign up with an online tutoring service such as Tutor.com or TutorVista.com. They will connect you with students who need help in the areas you are qualified to teach. You may also find opportunities to teach students from other countries how to speak English such as through VIPKID or a similar service. Everyone has a story to tell and, with the Internet, it has never been easier. Turn your advice, creative story ideas or special area of interest into an e-book. Do not be intimidated by the idea of writing a book. E-books do not have to be hundreds of pages long. In fact, many e-books are as short as 20,000 words or around 30 pages long. That may be the perfect length to write out your parenting tips, a guide to local events and attractions or a how-to guide related to one of your hobbies. If you are not a strong writer, put your ideas down on paper and then hire another freelance writer or editor to help you shape them into a book. You can then sell your book through online platforms such as Smashwords, CreateSpace or Lulu. Teachers and homeschooling parents are always creating their own worksheets, quizzes, lesson plans and other educational materials. You can profit from those materials by selling them on a website such as Teachers Pay Teachers. Remember that all materials must be entirely your own, not created using question banks, such as those you will find at HelpTeaching.com or any other copyright-protected artwork. 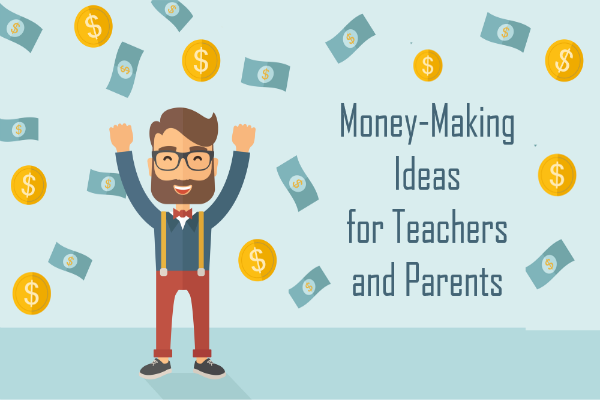 If you are a certified teacher, you may also be able to make money by creating materials for educational companies. Many educational websites, textbook publishers and educational software designers contract with teachers to have them design lesson plans, worksheets and test questions or have them review materials to ensure they will work well in the classroom. This work can often be done remotely and on a part-time basis during the school year. If creating educational materials is not your cup of tea or you have other talents, consider getting crafty. Sell your crochet-work, knitting or creative craft projects online using Etsy or another online shopping platform. If you are into stamping or scrapbooking, turn your skills into making stationery and pre-designed scrapbooks. Not sure what to make? Take a stroll around your local craft store for inspiration. A foam circle, some ribbon and artificial flowers could turn into a new wreath-making business. Wood and some paint could become kitschy signs and fun home décor. Flipping furniture is also a big trend. Browse thrift stores on the weekend for desks, hutches, bookshelves, tables, old chairs, and other pieces of furniture to re-stain, paint, and turn into something new. When companies launch new websites or products, they need people to test them out. Earn some money on the side by becoming a tester. UserTesting.com hires testers to review websites and answer a few questions about them. Software companies such as Microsoft also hire individuals to test out new products and websites. Not only can you earn money for your work, but you can be one of the first to experience cool new products and websites. In some cases, companies have random tasks that they are willing to pay people to do. While the tasks may only pay a few pennies or a few dollars to complete, the more you complete, the more the earnings add up. Websites such as Amazon Mechanical Turk have you complete random tasks, such as verifying website addresses or finding search results. You can also do some field research through apps such as Field Agent and Gigwalk. These apps send you to local businesses to search for products, verify addresses and take photos, giving you the opportunity to earn a few bucks for each task you complete. Want to control the type of tasks you complete? Try a site like Fiverr where you offer services and products for $5. Review websites, write poems, create logos or offer to do anything else you think is worth $5. If you can get enough people to take you up on your offer, you could earn decent money. If you have a specific skill, such as the ability to design webpages, work as a copywriter or complete the work of a virtual assistant you can also advertise your services and your price for those services on a website such as Upwork. Decompress after school by hitting the road and driving for a company such as Uber or Lyft. Some companies, such as Grubhub also hire delivery drivers to pick up orders from restaurants and deliver them to customers. Want to be a professional shopper? Sign up for a service like Instacart. You can also earn money by giving feedback to companies through surveys and focus groups. While not all survey websites are legitimate or will result in significant earnings, some can provide a decent part-time income. Survey Police is a website that can help you determine whether the online survey companies you find are legitimate. If you are social and like participating in online conversations, try a website like Crowdtap, where you can take surveys, participate in discussions and occasionally try free products to earn points that can be redeemed for gift cards and other items. Searching in the ETC column of your local Craigslist jobs board will often reveal local focus groups that can pay up to $100 for participation, usually in the form of gift cards. However, be careful not to give out confidential information until you have verified that the opportunity is legitimate. Don’t forget to check out local hospitals and universities for medical and psychological studies you may be able to participate in as well. Driving around town anyway? Make money by running errands for others at the same time. TaskRabbit pays individuals in major cities to run errands and complete tasks for users. Tasks range from grocery shopping to dog walking and home repairs. You may even find long-term work through the TaskRabbit app. If you find you enjoy running errands, you may even be able to start your own local business, advertising to busy executives, those who have difficulty leaving their homes and even other busy moms. Craigslist is also a place to find random jobs, such as walking dogs or helping move boxes. The last thing many teachers and parents want to do during their time off is spend more time around children, but if you have children of your own, babysitting may be the perfect way to earn extra cash while keeping your children at home with you. During the summer, working parents of elementary-aged children are often looking for affordable care. You can also serve as a drop-in babysitter, offering to watch local children for a small fee while their parents go to appointments or need to have some time to themselves for a few hours. Connect with a website such as Care.com or Sitter City so people needing sitters can easily find you. Chances are you have items lying around your own house that can help you make money. Sell those unused kids toys and clothes kids have outgrown using websites such as Craigslist, local swap groups on Facebook or a Just Between Friends or other kids’ consignment sales. Look for free items and good deals on Craigslist and at local garage sales, and then resell those items online or at a larger sale. Do your research by looking up current prices online to make sure you are getting a good deal on the items you buy and sell. Have an extra room? A mother-in-law suite you don’t use? Consider renting out your home on a site such as Airbnb. Just make sure you have time to prepare your home for guests and are willing to share with people before you create your listing. If you have family or friends in the area that will let you stay with them one weekend a month, you could even offer up your whole home to renters every so often. If none of the ideas above appeal to you, there’s nothing stopping you from starting your own business. All you need to get started is an idea and some funding. While the idea should come from you, the Internet can help with the funding process. Crowd-funding platforms such as Kickstarter.com, Indiegogo.com and GoFundMe are designed to help you find the funds you need to write the next Great American Novel, produce a video, design the latest, greatest invention or even start a cool new business venture. All you have to do is create a project proposal and start soliciting support from family, friends and individuals around the world. Making money during the summer, part-time or online requires thinking outside of the box and taking a look at what you have to offer. Make a list of all of your interests, hobbies and skills. Then think of ways you could get other people to pay you for using those interests, hobbies and skills. You may not start off making a lot of money, but as you build experience and get more people interested in what you have to offer, your summer job could turn into a way to fund a summer vacation, add a significant amount of money to your budget or even become a new full-time career. A former 8th grade English teacher, turned freelance writer, Stacy Zeiger is focused on helping educators and parents find ways to improve their students’ and children’s education. As a stay-at-home mom and military wife, Stacy has unique experiences to bring to her work. She regularly blogs about education and parenting, develops creative educational activities, writes lesson plans and creates workbooks for all age-levels and subject areas. Wonderful and helpful advice on finding extra income! Helpful advice on earning extra income! Thanks for this wonderful post. I’ve actually been trying to look for something like this, and thank God, I’ve stumbled upon your website. Dighted to read these suggestion as my frustration grew as I tried to figure out my summer project. Thank you.